Today I embark on an exciting blogging adventure, as a ‘Guest Driver’ for Haddad Toyota! 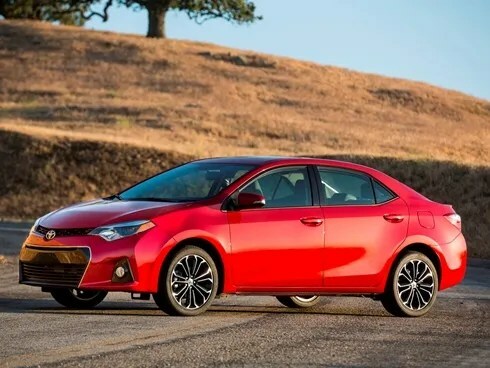 I’ll be testing out the 2014 Toyota Corolla for a week and sharing my adventures here and via my social networks Instagram, Pinterest, Twitter, Facebook, LinkedIn, and Vine. This is a special promotion I’ve just entered into with the dealership to use the power of social media to spread the word about a new product…I’m doubly excited, though, because Haddad did their homework with me. Not only am I a complete and total social media nerd and obvious blog enthusiast, I’ve also driven Toyota-manufactured cars for more than 15 years. I had a Toyota Tercel for 11 years until I finally traded it in — as JaxDad says, by that time, I essentially owed the car money. After bidding farewell to the Tercel, I bought a new Scion, which will be paid off in a matter of weeks (squeal). What can I say; they’re good cars. They last. They’re good on gas. It’ll be interesting to see what Toyota has in store for 2014, and car manufacturers in general, for that matter. I’d be lying if I said this wasn’t a great excuse to get out and see some great stuff as fall commences, documenting along the way! This blogtastic project also coincides with Blogtoberfest, my annual blog celebration of all things October, so I’ll be dragging some of my compadres along on my mini road-trips to keep things interesting and get some other people’s opinions about the ride. Let me know if there are any specific Berkshire destinations you’d like us to zoom over to, and we’ll do our best! Leave suggestions in the comments. A couple of housekeeping notes: This a straight test-drive in exchange for blogging and social media coverage – the dealership is providing the car for an extended test drive (7 days) and a gas card for fuel. There’s no other compensation involved. No, I won’t text and drive, I promise. The same goes for vining, tweeting, facebooking, pinning, and instagramming. This is a Haddad Dealerships/WriterJax endeavor. Read the FTC Blogger Guidelines here. Blogtoberfest is on… Guest Posts Being Accepted Now! Mom just got a Rav4….had it a month…still learning how to drive it….288 miles on it since Aug. 28…enjoying it so far…have fun, but stay away from guard rails!